It all comes down to gratitude, and for me, being involved in THON has shown me time and time again that there is no better way to give meaning to gratitude than by expressing it. I wanted to become a Director to be able to pour my time, effort, and entire heart into expressing the immeasurable gratitude I have for every Four Diamonds Family, volunteer, and experience in which THON has touched me over the past three years. Through those experiences, and especially through the little moments, I've come to witness that through the most tragic battles that life can throw at us, THON is a light. I felt inspired by the strength of every Four Diamonds families to want to spread that light to the entire THON community and especially to every family. I wanted to become a Director to continue to ensure that THON is a home for families, fueled by the passion of a community of volunteers who feel genuine gratitude for their displays of strength and courage. To fight alongside every single volunteer for something bigger than ourselves in an indescribable honor. What are your main duties as the Family Relations Director for THON 2019? The duties of the Family Relations Director are to oversee the involvement and interactions of all Four Diamonds families within the THON Community. Alongside of the Family Relations Committee, the Family Relations Director is responsible for communicating with families on a daily basis to ensure they are provided the utmost emotional support necessary during their current, or former battle with childhood cancer. 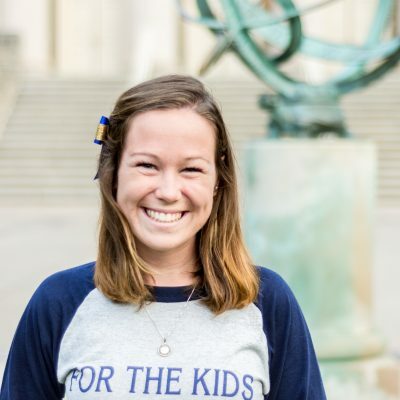 At each event, the Family Relations Director works to foster interaction between THON Volunteers and families by incorporating new and innovative activities that help to build long-lasting relationships with members of the community. The relationship the Family Relations Director maintains with several Four Diamonds staff members at Hershey Medical Center is crucial to the success of the position. The Family Relations Director works hand in hand with Four Diamonds staff to become well-educated on patients treatment statuses and help plan local events in the Hershey area. Two recurring themes that my favorite THON memory, and THON in general, has uncovered to me are that there is no limit to what defines family, and in that, that no one fights alone. I really understood what this meant when I first served as Club Cross Country’s Family Relations chair, in which I had the special opportunity to be the main facilitator between our team and our three wonderful families: the Kaufmans, the Carters, and the Fishers. By providing our three families emotional support, I came to know how by bringing these families and our team together as ONE family, they could never truly be in their fight alone. When I first met Bryce Carter at a canning trip in Fall 2015, I met a 17-year-old boy who had had to bear the frustration of missing out on a normal teenage experience. I met a boy that cancer had affected; not just physically, but emotionally. Over the next two years, through my position as Club Cross Country’s Family Relations THON Chair, I had the surreal opportunity to come to know a Bryce Carter that just shined. I witnessed Bryce’s gradual realization, as he played in his first soccer game in 6 years, won a State Championship, and grew into a leader for all younger THON children, that it was not cancer that defined him, but rather him that could define his cancer. The ultimate compilation of this journey led to a surreal moment during Family Hour of THON 2017. I stood arm in arm with Bryce and his younger sister, as we watched his name and picture pop up on screen and heard the beautiful words that he was five years cancer free. As his energetic sister jumped up and down, I hugged Bryce tight and soaked in the entire moment. The look on his face of indescribable joy encompassed all that THON is, and for that reason, this moment serves as my favorite THON memory. My greatest vision for THON and its mission in general that fuels my personal fight is that one day we won’t need THON as it is now. My vision is that one day, THON will be what we are working so hard towards: a dance marathon of celebration. I hope that one day, in the near future, Penn State student volunteers will get the incredible opportunity to donate their year-long efforts to a THON in which a cure for cancer has been established. That they get the opportunity to dance alongside families and children who have fought their battle and can know that no other kid will have to go through that too. That they can be relieved in knowing that kids will get to grow up and experience the joys and beauties of life’s simple moments without having to worry about cancer. That when parents hear the words “Your child has cancer,” they can be relieved in knowing that it will be cured. This very possible reality is what we ignite hope within our fight for.